The standard week long ‘I can’t possibly go out for dinner after eating all that cheese on holiday’ mantra has come to an end. And last night was one of those classic Soho evenings where there was an afternoon of texting back and forth about where we should meet for dinner and what we wanted to eat. No decision was made, obviously, because I’m rubbish at decision making. But we met in Kingley Court and thought we’d chance it. Didn’t fancy seafood, Ramen wasn’t my friend’s thing, Pizza Pilgrims had a queue out of the door and Senior Ceviché wasn’t going to cut it in the cold February weather. So Whyte & Brown it was. After a ten minute wait at the bar with our buzzer and a bottle of red we headed upstairs to be seated. 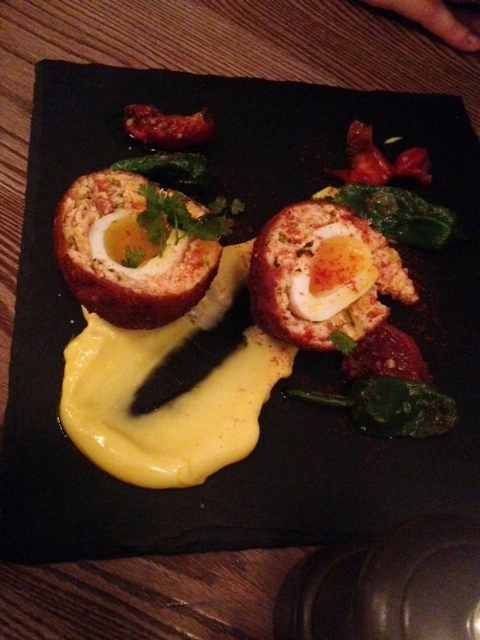 Chicken crisps, a Spanish Scotch Egg and Chicken, Ham and cheddar croquettes to start with. All were fine, nothing exciting I’m afraid. The croquettes were hotter than the sun with little cheddar in them, the crisps I think need to be warm to avoid the slightly unpleasant fatty taste that chicken skin can get and the scotch egg was bland. The egg needed something other than minced chicken to man it up a bit. I think there was supposed to be some chorizo in it but if it was there it was on some kind of stealth mission. We had a burger each. Both naked (bunless). Both served on a f***** slate, so everytime I cut through the burger and my knife touched the slate it screeched and set my teeth on edge. Everytime, no matter how careful I was. To the burger itself, it was nice, but I just don’t think a chicken burger works. Minced chicken doesn’t have enough fat to make a good burger. What it does have, when put under pressure, is enough density to become a fairly solid spongy lump. The problem is, the taste was good, a nice char from the grill. But the texture and density of it wasn’t right. Whine over. We shared some skinny fries, these are toothpick skinny, not French fry skinny – but they were well cooked and well seasoned. And there was a cute little salad served in a mini colander which was lovely actually – good and refreshing to go with the weighty burger. It was all ‘fine’ and ‘nice’. And that, in my uneducated opinion is the problem I have with it. Service was fin e. Decor was fine. And the food was just fine, not special, not exciting, not something I’d bother trying again, not that they’d probably want me to after writing this.